We will be holding our 7th Hawk Run on Friday, October 13th over at Alamosa Park. This event supports our culture of fitness and healthy choices at Alamosa Park Elementary. Why are we having a jog-a-thon? District budgets are not keeping up with Alamosa’s needs. Our jog-a-thon helps us raise money to supplement the budget. 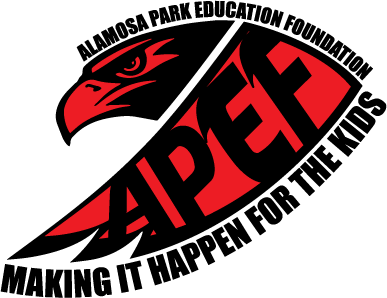 This year we are raising money to support our music and PE programs and put in two Makerspace Labs at Alamosa! This year we will be doing something else with the money raised - 10% of it will go right back to your child’s teacher to use for their classroom! It’s important to remember that 100% of the proceeds raised by this event go right back to our school. As a parent, how can I help? You can help your child obtain and record as many pledges as possible on the enclosed form. You can also visit our STORE to donate or record your pledges. Please share the website with family and friends to ask for their support. Please make sure to put your child’s name and teacher’s name in the notes so they both get credit for the donation. When do I need to return my pledge form? Please return all pledge forms to your child’s teacher on or before Thursday, October 12th. Are the donations tax deductible? Yes they are! Ask family, friends, neighbors and co-workers. Posting the web address on your social media page is a good way to spread the word.